In a republic we have rules — laws — framed by a Constitution that sets limits on how far they go, and on who can exercise them, while assuring that we can change them as needed, in an orderly process that protects the rights of all. Imagine these rules were gone, that they all changed, that a minority could routinely stop the majority from moving forward, that individual liberties could vanish. Imagine the squabbling members of Congress you see every night on television setting themselves up as modern-day George Washingtons, James Madisons and Ben Franklins, and flipping everything on its head. A bill calling for a U.S. Constitutional Convention — approved last year by the Iowa Senate State Government Committee and moving again this year — could do just that. The bill, Senate Joint Resolution 8, or SJR8, would put the State of Iowa on record calling for a constitutional convention, which could easily become a free-wheeling assault on our constitution, following whatever process it chooses, with no review by any existing court or legislative body. While the resolution asserts that such a convention would be limited, the scope of issues is so broad as to effectively erase limitations: “to impose fiscal restraints, and limit the power and jurisdiction of the federal government.” Even then, it is not clear that states have the authority to limit the scope of a convention at all. According to constitutional scholars, the delegates would likely be free to define any limits as broadly as they wish, or to ignore them. Why now? In some states, such as Iowa, far-right organizations including the Convention of States project and the American Legislative Exchange Council (ALEC) now have enough supporters in key positions to push for such changes even though none of this has been the focus — perhaps not raised at all — in Iowa election campaigns. Supreme Court Justices ranging from the liberal Earl Warren to the conservative Antonin Scalia have warned against the dangers of opening up the constitution to radical change. If 34 states pass such a resolution, Congress will call a constitutional convention. One group counts 28 states that have already signed on. It is conceivable that the threshold could be reached. The Constitution contains very little guidance on the procedures for, or scope of, such a convention. The only precedent we have to go on is the constitutional convention of 1787, at which the existing document, the Articles of Confederation, was scrapped and an entirely new constitution, our present one, was created. That convention even changed the rules for ratification. The delegates to a constitutional convention could set a rule that all decisions would require approval only by a simple majority of the states, with each state given one vote. That would allow the 26 least populous states, which contain less than 18 percent of the U.S. population, to rewrite the constitution. The Constitution provides no guidance as to whether such a procedure is permissible. And even if Congress were to establish rules for the convention, there is no mechanism to force the convention to follow those rules. Constitutional scholars say that under a convention now, the entire U.S. Constitution is up for grabs. It could quickly become a contentious and chaotic free-for-all, with moneyed interests free to lobby and purchase support however they chose. Iowa is shown as already on the approval list because of a resolution passed in 1979, but groups are pushing for a new one for fear that the age of that resolution will disqualify it, and because the wording of the 1979 version is different from the current one. Peter Fisher is research director of the nonpartisan Iowa Policy Project in Iowa City. ALEC — the American Legislative Exchange Council — persists in peddling “research” that knocks down its own policy ideas. In its latest edition of Rich States, Poor States, just released, ALEC’s Economic Outlook Ranking scores states on 15 measures reflecting ALEC’s preferred policies towards business. Our Grading the States analysis has exposed the flawed methodology of ALEC’s report, but the authors have not changed it for the 9th edition. ALEC’s dilemma: The index purports to predict which state economies will perform the best, but in fact there is no relation between a state’s score and how well the economy grows subsequently. Since the first edition in 2007, it remains the case that ALEC’s “best” states — the ones with the highest rankings — are actually poorer on several measures than the supposedly “worst” states. The graph below has been updated to reflect the 9th edition rankings and the latest income data. The 20 states that performed best on the four measures of income (the actual rich states) actually score much worse on ALEC’s ranking than the 20 states with the lowest income (the actual poor states). In its fervent anti-government bias, the report offers a package of policies — for fiscal austerity, suppressing wages and imposing proportionately higher taxes on low-income people — with a promise of economic growth, when it really is a recipe for economic inequality, declining incomes for most citizens, and starving public infrastructure and education systems of needed revenue. Posted by Peter Fisher, Research Director of the nonpartisan Iowa Policy Project and developer of IPP’s Grading the States website, GradingStates.org. We hear a lot about business climates from people who are looking for ways to cut taxes. But they usually get it wrong. One example is the Rich States, Poor States analysis produced by the American Legislative Exchange Council, or ALEC, an organization frequently considered a “bill mill” for corporate-friendly legislation. The centerpiece of Rich States, Poor States is the “Economic Outlook Ranking,” which ranks states on their conformance to ALEC’s preferred policies, with the best state ranked number one. But when we can compare states ranked the best by ALEC with states ranked the worst, it turns out that ALEC’s 20 “best” states have lower per capita income, lower median family income, and a lower median annual wage than the 20 “worst” states. ALEC’s “best” states also have higher poverty rates: 15.3 percent on average from 2007 through 2013, versus 13.7 percent in the “worst” states. 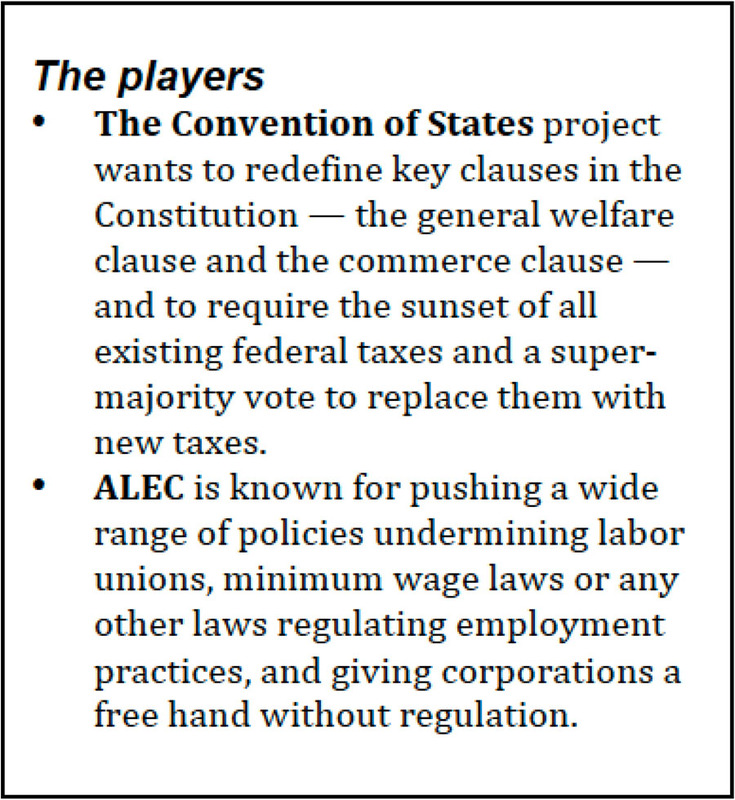 The states favored by ALEC include the likes of Utah, South Dakota, and Idaho, whereas ALEC’s “worst” states include New York, California, and Vermont. *Best and worst states according to the average Economic Outlook Ranking in Rich States, Poor States, 2007-2015. Income measures are an average over the period 2007 to 2014 (2013 for Median Income). Looking at it another way, the 20 states that performed best on the four measures of income (the actual rich states) actually score much worse on ALEC’s ranking than the 20 states with the lowest income (the actual poor states). *Average ALEC ranking of the 20 states that performed best on four measures of income — per capita income, median family income, median annual wage, and poverty rate — vs. average ALEC ranking of the 20 poorest states. An ALEC ranking of 1 is best. ALEC ranking is the average of the state’s rank in the first through eighth editions of the Economic Outlook Ranking; rich and poor states are defined on the basis of their average ranking on the four income variables from 2007 through 2013 or 2014. While Rich States, Poor States purports to provide a recipe for economic growth and “policies that lead to prosperity,” it actually advocates measures to lower wages and reduce opportunity for most Americans. To attain the highest EOR would require a state to have no individual or corporate income tax, no estate or inheritance tax, no state minimum wage, severe tax and expenditure limits, limited public services, and weak labor unions. The evidence and arguments cited to support these policies range from deeply flawed to nonexistent. We conclude that the actual purpose of Rich States, Poor States is to sell the ALEC-Laffer package of policies — fiscal austerity, taxing lower income people more than the wealthy and wage suppression — in the sheep’s clothing of economic growth. In actuality, the book provides a recipe for economic inequality and declining incomes for most citizens and for depriving state and local governments of the revenue needed to maintain public infrastructure and education systems that are the underpinnings of long- term economic growth. It might be a stretch to say that good research never gets old — at some point you might need an update — but one thing is certain: Bad research never gets good. IPP’s Peter Fisher is one of the nation’s experts on rankings of state business climates. In two reports published in the last two years by our colleagues at Good Jobs First, Fisher lays out irretrievable problems with the Rich States, Poor States analysis periodically offered by the American Legislative Exchange Council, or ALEC. Fisher tested ALEC’s claims against the actual economic performance of states, finding that states following ALEC-favored policy did more poorly than other states. * He also found serious flaws of methodology, including comparisons of arbitrary states instead of all 50. To borrow Oscar Wilde’s witticism about cynics, these “business climate” studies know the cost of everything and the value of nothing. In the case of ALEC, others are noticing. Michael Hiltzik of the Los Angeles Times has written twice in recent days about the ALEC problem, citing the work of both Fisher and Professor Menzie Chinn of the University of Wisconsin. It’s a curious document that ends up proving the critics’ point. Take the point made by Chinn and by Peter S. Fisher of the Iowa Policy Project that the correlation between ALEC’s policies and economic growth is largely negative. When the ALEC “analysis” is dissected, it becomes clear that its conclusions are faulty, and its policy prescriptions are no more valid. And it is good for Iowa to have Peter Fisher on the case. Some Iowa legislative leaders are taking issue with claims that all Iowa legislators are members of the American Legislative Exchange Council (ALEC). Groucho presumably was never a member of ALEC — like many Iowa lawmakers now protesting claims of their inclusion. But regardless of who belongs to ALEC, the bigger issue is whether ALEC belongs at the public policy table. Iowa Policy Project analysis has refuted the value of legislative initiatives promoted by ALEC, which is essentially a bill mill backed by corporate interests. IPP’s Peter Fisher and the national group Good Jobs First, in their 2012 report “Selling Snake Oil to the States,” showed that states following ALEC proposals were likely to show worse economic results than other states. No, that is not the ALEC mission statement. Again, they are words widely attributed to Groucho Marx. But if the shoe fits …. The first criticism leveled in Tax Myths is directed at an analysis in Selling Snake Oil of the factors leading to economic growth and rising incomes among the states between 2007 and 2012. In that analysis we argued that state economic structure — the composition of a state’s economy — is likely to play an important role in the short run in determining how well the economy fares; states more heavily invested in 2007 in sectors poised to grow in the succeeding five years would be expected to do better than states with a concentration of jobs in sectors that would be hit hard by the recession. Thus it was important to control for economic structure in a statistical analysis that attempts to identify whether the policy prescriptions of ALEC performed as advertised, leading to growth and prosperity. ALEC, in Tax Myths, appears to have completely misunderstood what was done in our analysis; their criticism seems to be based on the assumption that our model was predicting changes in the share of employment by sector. Instead we were simply using 2007 economic structure — measured by employment shares — to predict rates of growth in overall state GDP, employment, and personal income. Their criticisms make no sense and are completely off base; 2012 state GDP cannot be a cause of 2007 economic structure, which is the circularity they argue undermines our analysis. Second, they argue that economists have found a strong relationship between tax policy and economic health, and cite two pieces of research in support. In Selling Snake Oil, we devote several paragraphs to a discussion of the many reviews of dozens of research articles over the past 30 years that have led to the conclusion that business taxes have, at best, a small effect on business location decisions. In our piece, we looked at the consensus among a large number of economists who have examined this question; in Tax Myths, they found two that supported their position and ignored the rest. The third criticism is directed at several scatter plots and associated correlations that were presented in Selling Snake Oil. In those charts we were illustrating how states that were ranked high or low by ALEC in the first edition of Rich States, Poor States in 2007 actually performed in the time since then. Did the states that ALEC ranked high on their Economic Outlook Ranking (EOR) actually perform better than others? Since all ALEC provided was the state rankings (not an index number showing their relative strength or weakness), we correlated those rankings with the measures of performance that ALEC emphasizes: growth in GDP, employment, and income. ALEC argues a technical point here: The formula used to calculate the correlation between two continuous variables (the Pearson coefficient) is different from the formula used to calculate the correlation between two rankings (the Spearman coefficient). We had one ranked variable (the EOR), and one continuous variable, and used the Pearson coefficient. To respond to this criticism, we converted all of the performance variables to ranks first, and then calculated the Spearman coefficient. The conclusions were the same (Table 1). Where there was no statistically significant relation using the Pearson formula (as was the case when we looked at the EOR as a predictor of growth in GDP or jobs), there was also no significant relation using the Spearman. Where there was a statistically significant and negative relation (high ranked states have lower per capita and median family incomes) using the Pearson measure, the same result occurred with the Spearman. In only one instance did results change: Our original analysis showed a negative but not statistically significant relation between EOR and the growth in state revenues. The analysis substituting the state rank in revenue growth and using the Spearman coefficient found a negative effect as well, but this time the effect was stronger and statistically significant. Finally, Tax Myths presents an alternative to the analyses in Selling Snake Oil, correlating the state EOR each year with the June value of the “state coincident indices” published monthly by the Federal Reserve Bank of Philadelphia for each state. The coincident indices are based on four measures of the health of the state economy: non-farm employment, average hours worked in manufacturing, the unemployment rate, and wage and salary disbursements. ALEC found a strong correlation between a state’s EOR and the value of the coincident index. The state coincident indices are designed for tracking the course of a state’s economy over time — whether it is sliding into recession or on a path to recovery — and are pegged to a value of 100 for every state as of 1992. They are used to compare states, but only in terms of the changes in the index over time. So the value of the index as of 2008 is a measure of that state’s growth rate from 1992 to 2008, since every state started at 100. However, a high value for state X in 2008 does not mean that state X has a healthier economy in some sense than state Y with a lower value in 2008, because state Y could have started out with a much higher level of prosperity in 1992 and still have higher incomes and wages than state X in 2008, despite growing more slowly. Furthermore, the correlations performed by Fruits and Pozdena are taken as evidence that ALEC policies, as represented by EOR, cause economic health, but they have done it backwards, in effect trying to demonstrate that conformance to ALEC policies in 2008 caused states to grow more rapidly from 1992 to 2008! So why didn’t they look at the policies in place as of 2008 and see if they predicted economic growth from 2008 to 2012? The answer is, because the correlations between the EOR in 2008 and changes in the state coincident index subsequent to that are near zero. This is not the result they were looking for. In Selling Snake Oil, we argued that a more sophisticated approach to identifying the effects of a state’s EOR would entail a statistical analysis that controlled for economic structure, as described earlier. In fact, a Philadelphia Federal Reserve Bank economist in an article about the state coincident index explains how state economic structure is an important determinant of the path of the state economy, as measured by changes in that index over time. [v] We decided to see how the coincident index measure of economic performance fared in our regression model. So we used our 2007 economic structure variables, along with either the EOR or several key measures that are components of the EOR, to predict the rate of improvement in a state’s coincident index from 2007 to 2012. The results were much the same as our previous analysis, using growth in GDP, employment, or income as the performance measures. In other words, when state economic structure is controlled for, none of the ALEC policy variables, including the EOR, had a statistically significant effect on the rate of improvement in the state’s economy over this period. In sum, nothing in Tax Myths actually undercuts any of the analyses or conclusions in Selling Snake Oil. In fact the authors’ misinterpretation of our use of economic structure variables and misuse of the state coincident indices serves only to further confirm the shoddiness of the research sponsored by ALEC. Peter Fisher is Research Director of the Iowa Policy Project (IPP), a nonpartisan, nonprofit organization that engages the public in an informed discussion of policy alternatives by providing fact-based analysis of public policy issues. 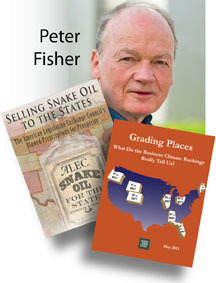 Fisher holds a Ph.D. in economics from the University of Wisconsin-Madison and is professor emeritus of Urban and Regional Planning at the University of Iowa in Iowa City. He is a national expert on public finance and has served as a consultant to the Iowa Department of Economic Development, the State of Ohio, and the Iowa Business Council. His reports are regularly published in State Tax Notes and refereed journals. His book Grading Places: What Do the Business Climate Rankings Really Tell Us? was published by the Economic Policy Institute in 2005.